I don’t know who invented the idea of the dramatic arc. 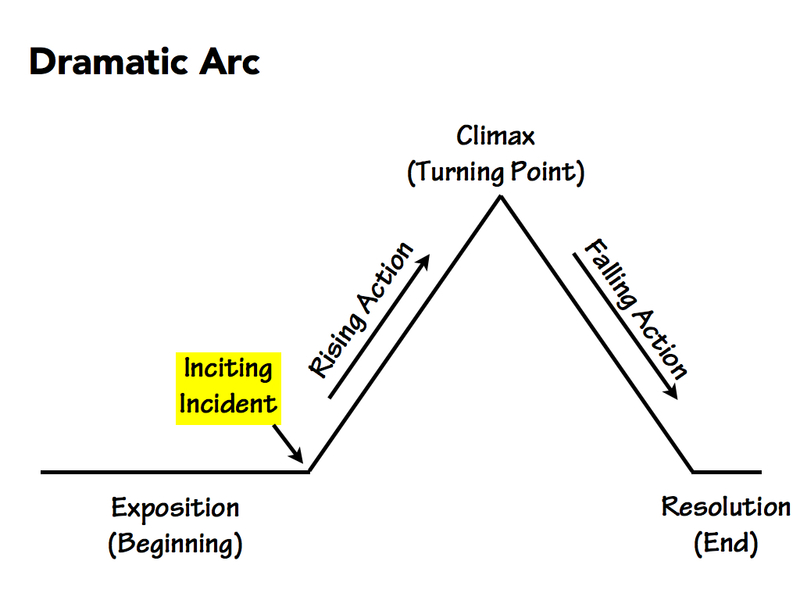 My idea, with minimal investigation, is that the dramatic arc is useful after the fact to talk about stories on film. 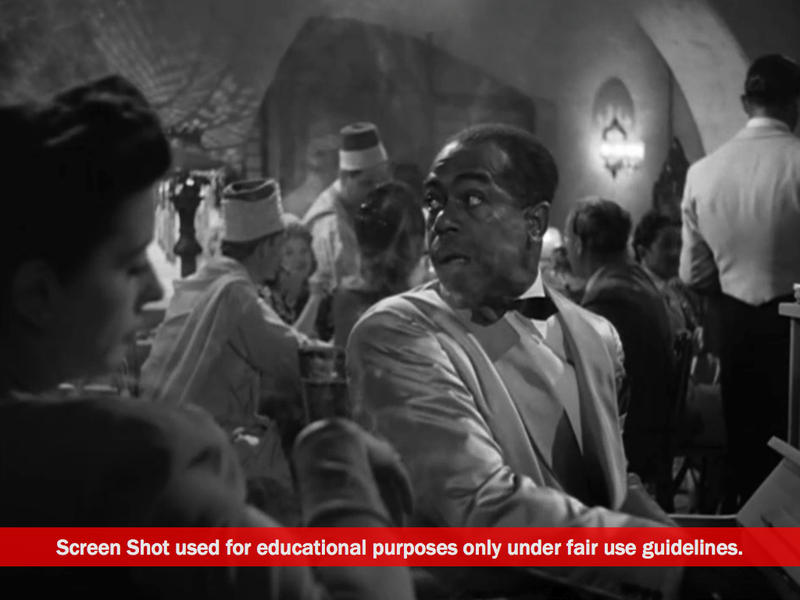 It seems to work with Casablanca. I’m not sure how helpful it is on the front end for the writer to have the dramatic arc in front of him or her as a guide for what comes next. If we follow a typical dramatic arc for a story, the exposition is over. 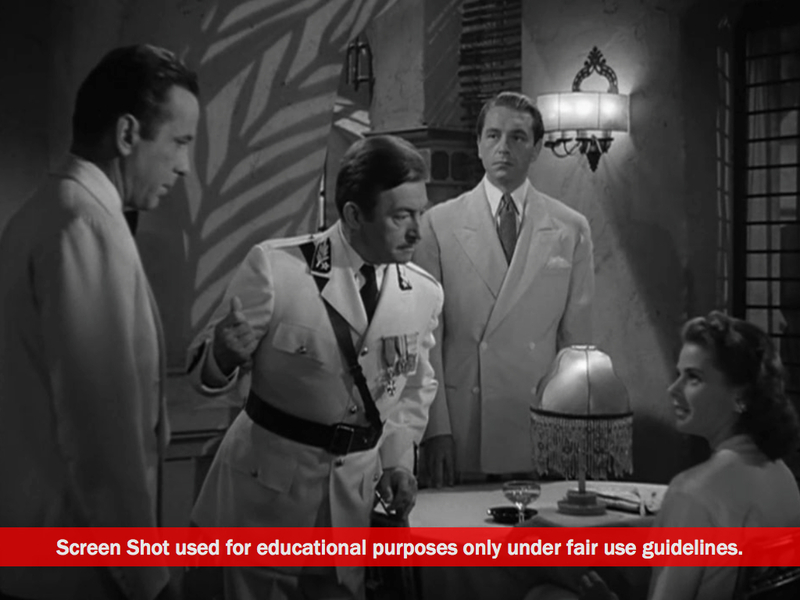 (See Casablanca | The Story Pt. 1 —Exposition.) Now we need an inciting incident. 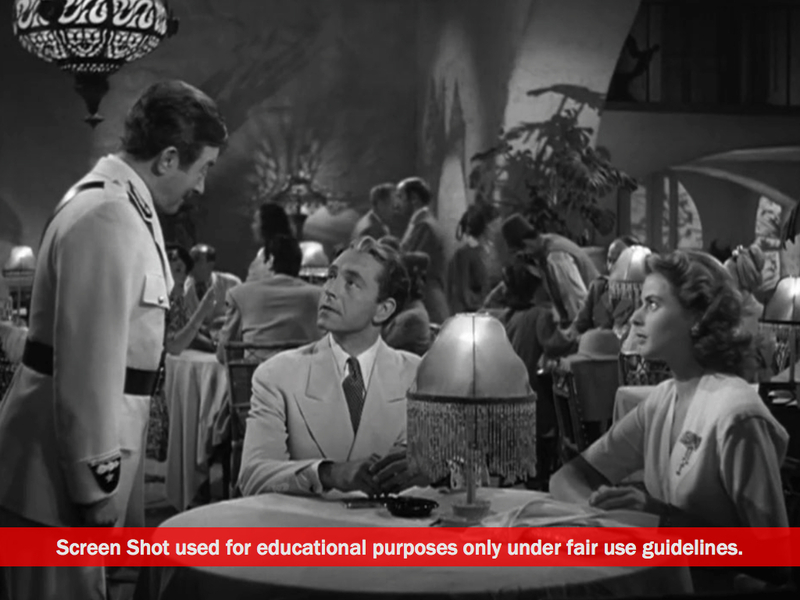 The genius of Casablanca is the way that through the exposition the playing board has been set up with something that we know is a problem that must be dealt with (Victor Laszlow) and something we don’t know is a problem that is going to overshadow the other problem (Rick’s attitude toward women as evidenced by his treatment of one in his bar, and the woman traveling with Laszlow). 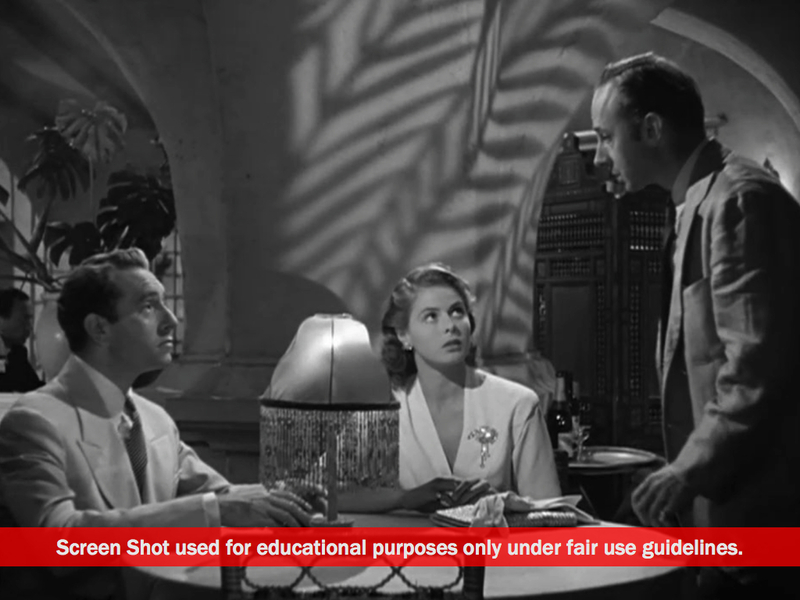 Up to now, this has been a story about a place (Casablanca) that people want to use as a launching point to freedom, but which has become a dead end, and the arrival of an individual who the Nazis want to ensure does not become exceptional. The story is about to become quite personal for Rick. The inciting incident is actually an entire scene that begins as a couple enters the saloon. The man identifies himself to the host as Victor Laszlo. We will soon learn he is the man who was going to pay a fortune to Ugarte for two exit visas. As the couple walk to a table, the woman and Sam, the piano player, make eye contact. We can see that they know each other. It’s more than recognition, though. The look on Sam’s face suggests a kind of alarm. We thought Laszlo coming to Casablance was a problem. Perhaps there is another problem, not with Laszlo, but the woman who is accompanying him. Her own look of concern seems to confirm this. The couple are seated. Laszlo attracts all sorts of attention. If “everybody goes to Rick’s,” then inside Rick’s, everybody goes to Laszlo. First, a member of the underground, Berger, introduces himself to Laszlo. They agree to meet at the bar in a few minutes. Captain Renault then introduces himself to the couple. Laszlo presents the woman as Ilsa Lund. 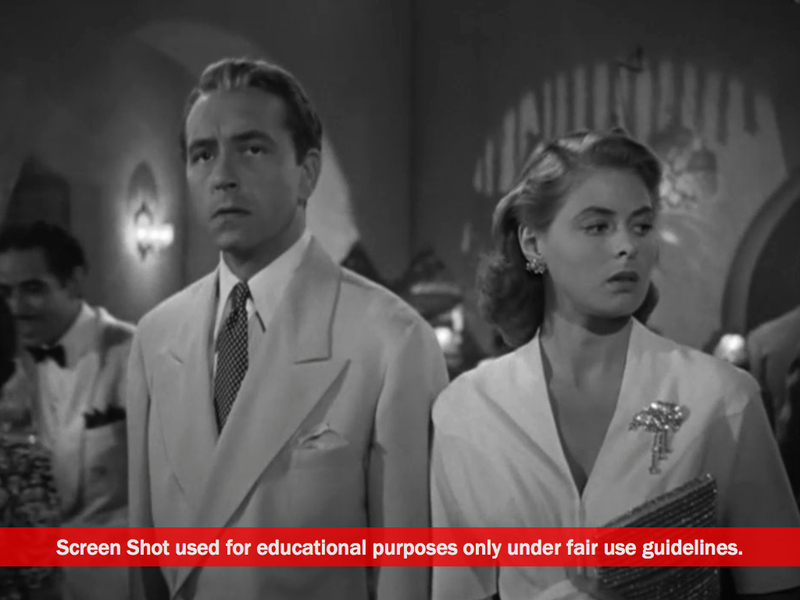 Renault says, “I was informed you were the most beautiful woman ever to visit Casablanca. That was a gross understatement.” Ilsa asks about the piano player and is told how he came from Paris with Rick. Lund keeps it cool, but you can tell this is not great news for her. Now, Major Strasser joins the conversation and things quickly become heated between he and Laszlo. They set up an appointment to have a conversation that will take place the next morning in Renault’s office. During a musical number by one of the other musicians in the bar, Laszlo takes off to meet Berger at the bar. 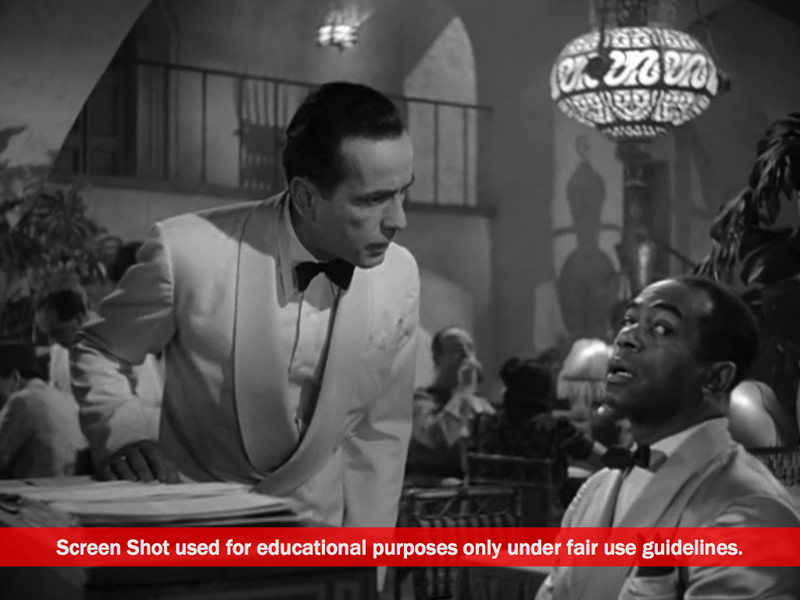 Laszlo confides that he is looking for a man named Ugarte, who is supposed to help him. Berger breaks the bad news that he “cannot even help himself,” because he’s been arrested. This is a blow. Renault interrupts their conversation. It appears Laszlo is not going to be left alone by the local authorities. Laszlo is receiving Renault’s near-complete attention. Meanwhile, Ilsa asks to have Sam bring his piano over to her table. There is a mystery here. 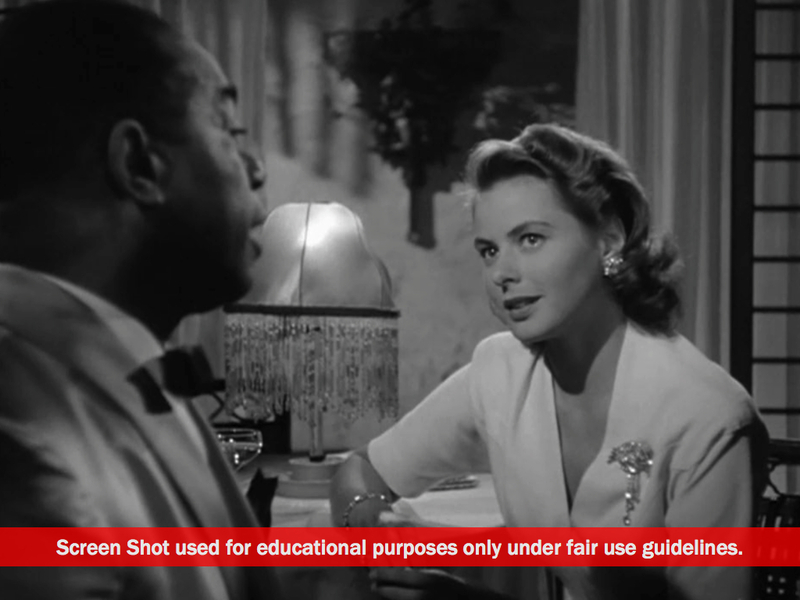 Ilsa and Sam have on some level shared life together and she asks him to play “some of the old songs.” Ilsa asks about Rick and Sam dissembles, suggesting that Rick isn’t around, that he’s meeting a girl at The Blue Parrot. We know better. Rick is very much involved in his business. It’s pretty obvious that Sam is protecting Rick. 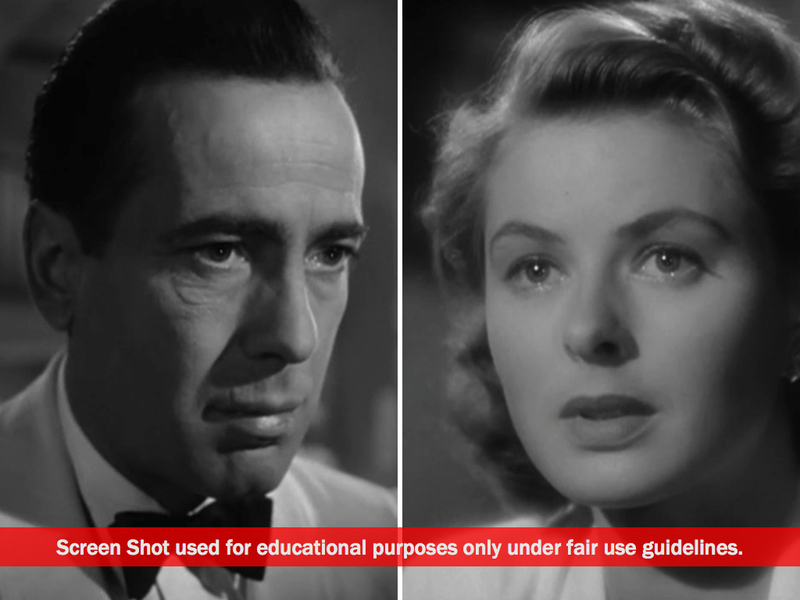 When Ilsa tells Sam that he “used to be a much better liar,” Sam responds, “Leave him alone, Miss Ilsa. 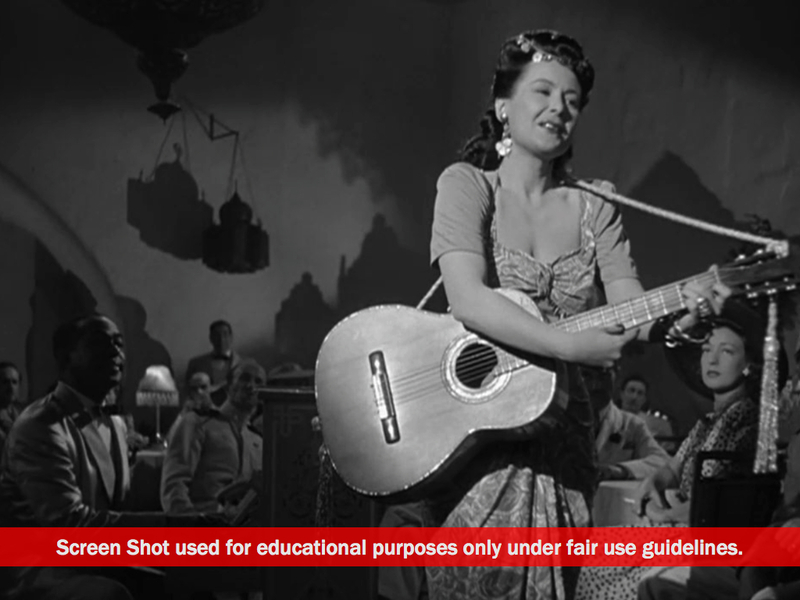 You’re bad luck to him.” Undeterred, Ilsa asks Sam to “Play it once … for old time’s sake.” Ilsa had a song. After some cajoling, Sam, a reluctance and terror on his face, plays “As Time Goes By.” It’s a lovely song. Iconic, now, after all these years. It’s deeply affecting for Ilsa. Rick has heard “As Time Goes By” elsewhere in the casino. His reaction suggests it’s deeply affecting for him, too, but for him produces a great deal of anger. He storms over and says, “Sam, I thought I told you never to play . . .” He is cut short by a look from Sam. There are two close-ups of Rick and Ilsa. Rick is shocked. Ilsa has tears in her eyes. Ilsa’s song was Rick and Ilsa’s song. This is a very interesting café. I congratulate you. For all appearances, Rick is a highly successful businessman, running an operation that combines both the honest (a bar) and the illegal (a casino) to be profitable without getting him into too much trouble with the authorities. In this moment we realize that Rick doesn’t exactly respect the work he is doing. Earlier he said to Major Strasser, Herr Heinze, and Renault, “You’ll excuse me gentlemen. Your business is politics. Mine is running a saloon.” This is true, but not the whole truth. We’re learning we can’t trust everything Rick says. Rick is running a saloon, successfully to all appearance, but there is other work that he respects more. If his business isn’t politics, his interest surely is. Renault steers the conversation to how Ilsa and Rick know each other. They admit to having been acquainted in Paris, but there are no details offered. After the look of shock and the tears, they are playing it cool. It’s getting late and there is a curfew, so the party breaks up. On their way out, Laszlo comments to Ilsa, “A very puzzling fellow, this Rick.” He asks, “What sort is he?” Ilsa replies, “Oh, I really can’t say, though I saw him quite often in Paris.” You can tell this is only a partial truth. 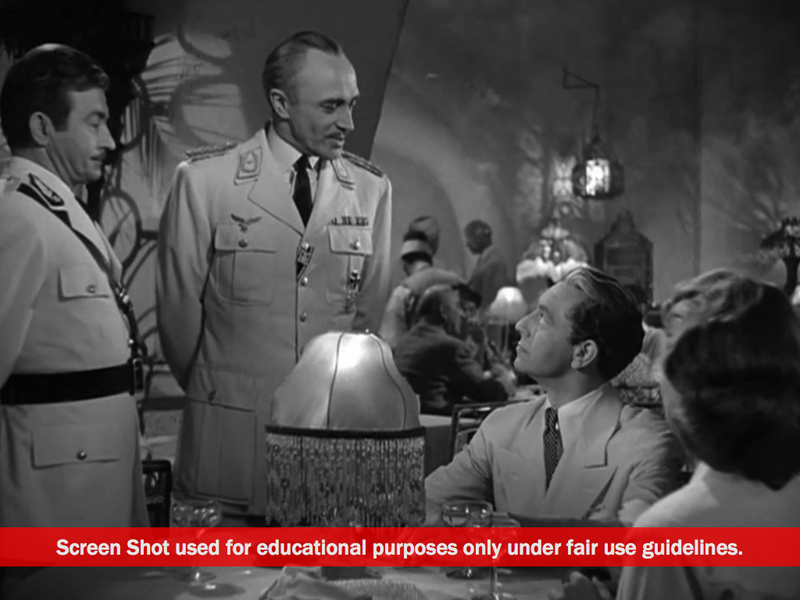 Until moments ago, it seemed the main problem Casablanca presents is a political one: what to do about Victor Laszlo, the proverbial fly in the Nazi soup? But with the entrance of Ilsa Lund, another issue presents itself: What’s the story with Rick and Ilsa? Why the tears from Ilsa and the flash of anger from Rick over a song? 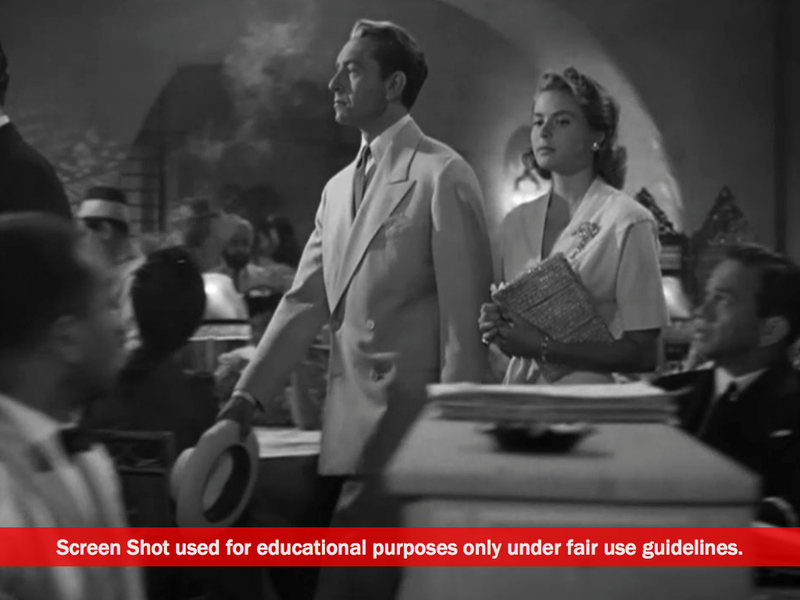 The first 25 minutes of Casablanca were exposition. We’ve now had an inciting incident, the arrival of Victor Laszlo and Ilsa Lund, a scene that has taken about ten minutes. For the next hour, things are going to get very interesting.